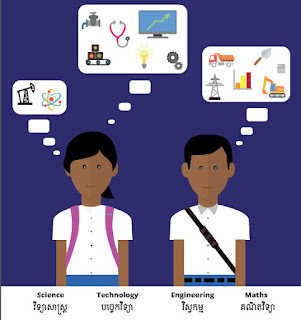 The guide identifies the top 20 (Science, Technology, Engineering and Maths) careers gaps in Cambodia over the next 10 years. Presented in a user friendly and eye catching way, it includes information on the education and training needed, where students can study, and the progressive salaries that can be expected. The aim of the guide is to show young Cambodians what exciting career opportunities there are in , to introduce important jobs they may never have heard of, and to motivate them to choose . The guide includes case studies of Cambodian professionals successfully working in each career who share with young Cambodians what is required skills-wise for the exciting opportunities available in. The publication is a product of extensive research conducted by Saint Blanquat & A. with funding from the British Embassy. This research included discussions with industry experts, quantitative surveys and face-to-face interviews with over 300 organisations in Phnom Penh, Siem Reap, Battambang and Sihanoukville.